I'm a little bit in love with this new book, and probably its author, as well, although a good fifteen minutes spent with an excerpt from last week's NYT Magazine will have to suffice until I can get my grubby paws on the tome itself. 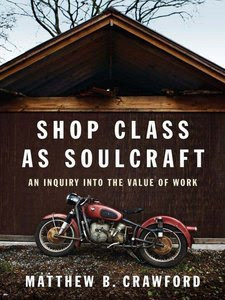 Shop Class as Soulcraft: An Inquiry Into the Value of Work, by Matthew B. Crawford, combines all of the best aspects of the sociology of work with embodiment theory and some economics, too, to create a beautiful little treatise on labor and bodies and work and nourishment and meaning in contemporary America. I've kept the NYT excerpt open in my browser window here all week, reminding me of these themes every time I turn to my laptop, which has meant that all this dishy stuff about the sociology of labor has been swimming around in my consciousness ever since. When I've come home in the wee hours after shaking martinis all night, body sore and tired and spent and covered in vodka (and maybe a little bit glowing and alive? ), it's been utterly affirming, thought-provoking and inspirational. Crawford's work brings to light all of those rich Marxian ideas of alienation and sensuous labor, the hope that it's indeed possible to find work that engages the mind and the spirit and the body all at once, that nourishing kind of labor that feeds the soul and fires the imagination while actually employing the body in its service. Whew. Dreamy. Crawford's got mad intellectual street cred, a Ph.D. in various heady theory and whatnot, lots of teaching and policy experience, but the man now runs a vintage motorcycle repair shop in Richmond, VA, and his book addresses the cultural tangles we find wrapped up with work and manual labor: class and status and education and prestige and capital and skill and freedom, oh my. When Crawford writes about the physicality of motorcycle repair, the careful subtlety and stealth intellect involved in solving mechanical mysteries, it's hard not to see the poetry, the elegant back-and-forth dance, of this kind of work. And then when he goes on to describe the powerful community ties and relationships inherent to his line of work, you'll see what a great richness might lie in revaluing this kind of denigrated labor. Read the excerpt - "The Case for Working With Your Hands" - for a good starting point. Enjoy his edgy honesty, his authentic sensibility, his seemingly-subversive call for a revaluing of manual labor in the light of changing economic and technological atmospheres. (Crawford cites Marge Piercy's "To Be of Use," which I've posted below, because it's just so damn good.) Pick up the book itself. Question whether your paper-pushing might feed you the way a little dirt and grime and soreness might otherwise. Dig into these big questions of labor and meaning and life and fulfillment. It's soooo dishy. Mmm. I didn't finish reading that, but it looked great. I meant to e-mail it to myself. I'll have to get my hands on the book ASAP. It's a light read and quite entertaining. I love buying books. I have WAY too many as I discovered while moving. Oh yeah, this is Joseph by the way. I changed my online name.